All right. European, Canadian and Mexican officials are promising to retaliate in response to steel and aluminum tariffs that the Trump administration imposed today. These tariffs were first announced by the president in early March. He then suggested that some countries could be exempted. As NPR's Jim Zarroli reports, the administration has a pattern of mixed signals on trade. 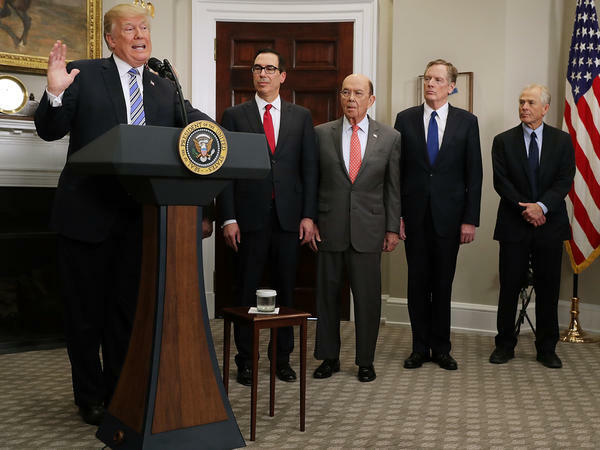 JIM ZARROLI, BYLINE: For weeks, the Trump administration has threatened to impose major tariffs on imports from China. Recently, Treasury Secretary Steve Mnuchin told Fox News that talks with China had made progress. STEVEN MNUCHIN: We're putting the trade war on hold. So right now we have agreed to put the tariffs on hold. ZARROLI: But Mnuchin was contradicted by Trump trade adviser Peter Navarro, who said in an interview with NPR this week that the remarks were an unfortunate soundbite. The Trump administration has sometimes displayed a split personality on trade. Someone will make a tough-sounding pronouncement only to change course later. The president pulled the U.S. out of the Trans-Pacific Partnership then said he might consider rejoining it. He announced tariffs on steel and aluminum imports then spent three months deciding whether to exempt certain countries. Dan Ikenson of the pro-trade Cato Institute says trying to find a coherent strategy in all this can be mentally debilitating. DAN IKENSON: My view is we need to distill the signal from the noise. The problem is, if there's a signal there, it's pretty weak. ZARROLI: The divergent policies reflect the sharply differing views of Trump's economic team. It includes trade hawks such as Navarro and U.S. Trade Representative Robert Lighthizer, and orthodox free-traders such as Mnuchin and National Economic Council head Larry Kudlow. But the president also appears to see sowing confusion as a bargaining tactic at a time when the U.S. is in negotiations with some of its major trading partners. Eswar Prasad is a professor of trade policy at Cornell University. ESWAR PRASAD: The strategy, if one can call it such, seems to be that threats, bullying and some degree of unpredictability can gain the U.S. an upper hand in trade negotiations. ZARROLI: Prasad says this may produce some short-term victories, but it could also erode trust in Washington among U.S. trading partners. Adding to the confusion has been Trump's unconventional willingness to mix trade and foreign policy goals. For example, Chinese telecom company ZTE was barred by the government from buying parts in the U.S. because it violated sanctions on Iran and North Korea. But Trump has said the punishments could be reduced as part of a trade agreement with China. Celeste Drake is a trade policy specialist at the AFL-CIO. CELESTE DRAKE: It doesn't seem that saying we're going to go easy on ZTE because we've had some good discussions with China about some other things is really the best way to defend national security. ZARROLI: Likewise, Trump argued that tariffs on steel and aluminum were needed to protect industries vital to national defense. The global trading rules are changing, leaving U.S. trading partners confused about where Washington is going, and that may be what the administration is banking on. Jim Zarroli, NPR News, New York. Transcript provided by NPR, Copyright NPR.